Banks, led by State Bank of India, plan to provide the funds against shares pledged by founder and Chairman Naresh Goyal and partner Etihad Airways PJSC and backed by their guarantees, people in the know of things have said. Jet Airways India Ltd., the beleaguered carrier that’s in the midst of bailout talks with its partner and lenders, is set to get an emergency loan of as much as Rs6bn ($85mn) to help it tide over a cash crunch, according to people familiar with the matter. Banks, led by State Bank of India, plan to provide the funds against shares pledged by founder and Chairman Naresh Goyal and partner Etihad Airways PJSC and backed by their guarantees, the people said, asking not to be identified before a public announcement. The disclosure is likely to be made after Jet Airways’ extraordinary shareholder meeting scheduled for February 21, one of the people said. Representatives for SBI and Jet Airways didn’t immediately respond to emails seeking comment. Etihad declined to comment. 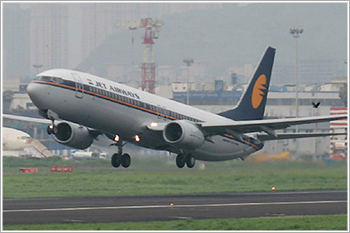 Jet Airways’ shares, which has dropped 73% in the past year, gained 1.4% at Rs224.25 in Mumbai on Wednesday. Under one proposal, Etihad, which owns 24% of Jet Airways, will raise its stake to almost 44% by boosting capital at Rs150 rupees a share, the people said. Goyal’s stake would fall to about 22% from 51%, and lenders would end up with more than 15% after swapping a part of Jet’s loans to equity, the people said.